–What side of the fence does the wire go on an interior fence? Livestock are often on both sides of the fence. –What about a fence between neighbors who both own livestock? –If the fence is electric, livestock don’t push against the wire so why does it matter? –Why do the livestock want to stick their head through the fence and graze the roadside? 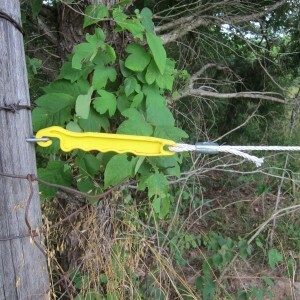 Since there is no good answer to the “which side of the post to attach the wire on an interior or neighbor fence” question, then why was it so important on an exterior fence along the road? I think it comes down to the way we used to, and some still do, graze their livestock. The grass was almost always better [greener] on the other side of the fence, so we would often see the cow with her head outstretched through the wires grazing the roadside. I like to think that our grazing practices now make the grass the cows are grazing on our side of the fence as good and, hopefully, better than the roadside. With daily moves and longer rest periods, the grass they are grazing is usually more lush than what’s outside the fence. But the truth is, with electric fencing the cows don’t know what the roadside grass tastes like because they definitely don’t have a strong enough desire for it to overcome the shock of reaching it. Gary Duncan called me one morning and said he had been discussing with a customer this question about an interior one wire electric fence and the woman asked him why she couldn’t just alternate which side of the wire she drove the posts. In other words, pull the guide wire tight, but then drive every other post on opposite sides of the wire. She thought this would keep cotter pins from having to take all the pressure of deer hitting the fence since some of the pressure would be against a post and some on the cotter pins. I said to Gary “posts on both sides of the wire-that just doesn’t seem right!”. He said that’s what he thought too, but then he said “why?”… I had no answer and the more we discussed it the tougher it became to come up with an answer. My advice is to keep your fence line straight, your wires tight and put the wire on whichever dang side of the post pleases you. 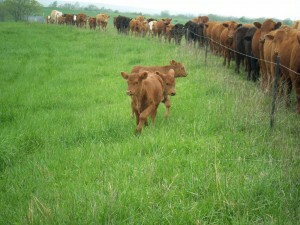 I wrote an article about trying Ultra-High Density Grazing back in 2007. http://www.pasturepro.com/blog/2010/03/my-experience-with-ultra-high-density-grazing/ Still, as at that time, I’m not sure what defines Mob Grazing (MG) but have learned that it’s a much better marketing phrase than Ultra High Density Grazing! We began using MG way back in the early 90′s during the winter with stockpiled fescue on rented farms. Each year we came to trust more and more what we were doing until we eventually sold all of our hay equipment. One of the best decision we’ve ever made. It was the key to making our farm more profitable. Learning to work with portable fencing and judging stock densities and forage availability is done most easily in the winter. Grass isn’t growing and a back fence to keep cattle from going back on what they’ve grazed is less important. 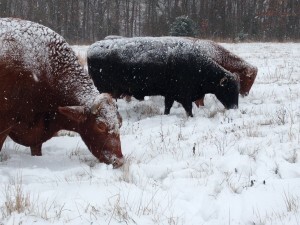 Water, which is often the toughest challenge in developing grazing plans, is easier because cattle are content to walk farther to drink in the winter allowing the farmer to have fewer freeze proof water points. It’s also easier to measure and calculate grass availability for grass that’s not growing, allowing a new grazier time to develop their “grass eye”. 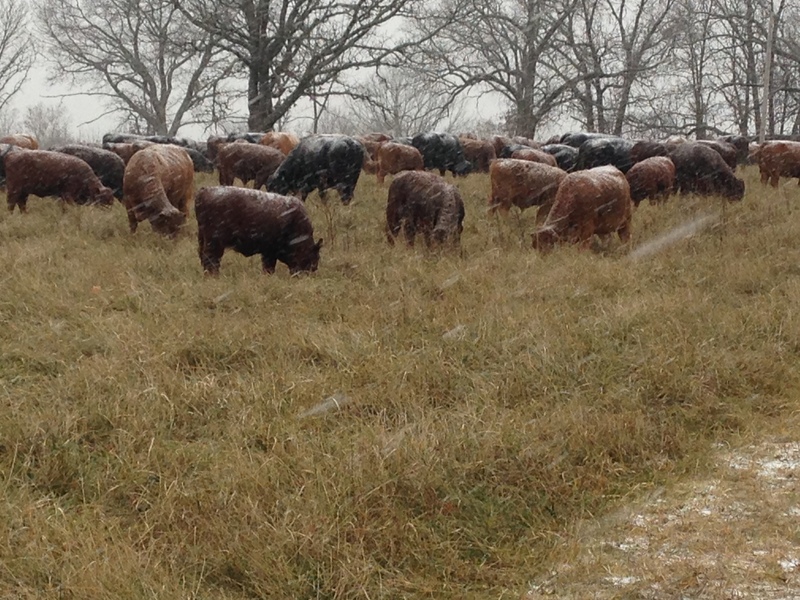 Our stockpiled winter pastures are dominated by KY31 fescue. It’s one of the best grasses for winter in our area because it maintains it’s green and doesn’t shrink up and go away when it becomes cold. 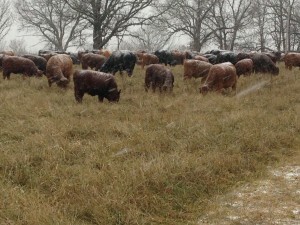 It maintains enough quality to keep a pregnant cow in good shape through the entire winter. Because we move cattle only once a day our stocking density varies with the density of stockpiled grass available. It usually ranges from 80,000lbs to 150,000lbs per acre, per day. We often have the cows graze through snow, but not all snow allows grazing. Here in the Ozarks we often get freezing rain and ice pellets before a snow or enough freezing and thawing to make the snow icy and hard. Our stockpile is a precious commodity so we just plan on feeding hay when it’s like that for we find a lot of stockpile is wasted when the snow gets hard. Recently, the snow wasn’t hard but we had temps below zero and winds blowing at 25 miles an hour so we fed hay next to windbreaks. Unfortunately, many of our paddocks are without windbreaks and it wouldn’t be right to not provide the livestock a place to get out of strong cold winds like we were having. Taking twenty minutes a day to move cows with poliwire sure beats driving a tractor and feeding hay. The beauty of winter feeding with stockpile is that it really doesn’t matter how many cows you have- it takes about the same time to move 500 as it does 50. Our farm is primarily stocked with cattle, but my wife and daughter have long had the equine bug and we have a “retirement village” for two of my daughter’s old show horses. These retirees, aged 17 and 26, both have physical limitations that require some special handling. Bandit, a 26 year old former western pleasure gelding, has arthritis that is eased by plenty of light movement. Kitty, a 17 year old former dressage mare, has a degenerative eye condition and has been steadily losing her eyesight for nearly a decade. We feel it is really important for horses to have adequate turnout, and because of our horses’ physical conditions, it was really important to us to have turnout areas for them that would allow both to get plenty of exercise and that was as safe as we could make it, especially for Kitty. So, back in 2004, we installed some of the first PasturePro posts ever made for our horse paddocks. We combined HorseCote™ wire and 1472 black posts, a combination we picked because we felt it would minimize the risk of injury to the horses. 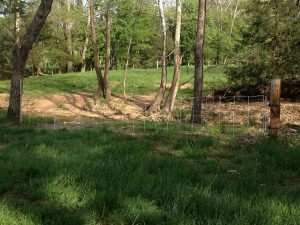 We created two turnout areas, one about 3000 square feet and another about 1/8 of an acre. Our two retirees make the approximately 200 foot walk from the barn to the paddocks every day. Over the past seven years, we’ve had two incidents with our horses and the fences. One, back in 2007, involved another one of my daughter’s dressage horses who had recently traveled from North Carolina to the farm for some R&R. She was blowing off some steam after her long trip and attempted to stop a bit too close to the fence. She hit a patch of mud and slid into the fence sideways. The posts bent nearly to the ground, then flexed back up. The mare had lines of black coating across her body where she had come into contact with the HorseCote wire, but walked away completely unharmed. We speculated at the time that with most fences she could have sustained very severe injuries from the incident, and were quite relieved and assured by the performance of the fence and the posts. The second incident was with Kitty, the horse who is now nearly 100% blind. My wife found her one morning on the wrong side of the fence with a large laceration on her chest. We don’t know exactly how she got tangled in the fence, but we speculated that something scared her (stray dogs or coyotes). It looked like she had tried to go through the fence and ended up straddling the top of it for nearly 90 feet as she tried to run away from whatever was frightening her. After close inspection of the section of fence, we found that it was the strainer at the end of the fence that had caused the injury. The veterinarian that stitched up the wound speculated that if we had built the fence with t-posts instead of the composite posts, she would have lost her leg. He was able to stitch her up and we brought her home for stall rest. Fortunately, this mare has one of the most remarkably calm personalities any of us have ever seen in a horse, and she made a full recovery to her retirement lifestyle. This incident brought to light how important it is to think about ALL of the components that go into building your horse fence. Bottom line – there is no fence in the world that is 100% safe for horses. Known for “finding ways to hurt themselves”, horses have a notorious track record with fencing of all varieties. 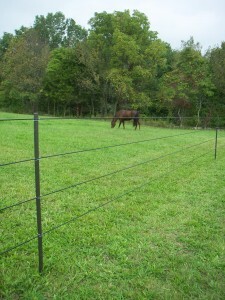 Electric fence can be a safer option for horses than many types of fencing, but must be built to minimize hazards. That said, I’ll be making a few adjustments to our fence to help make it even safer for our beloved blind retiree. 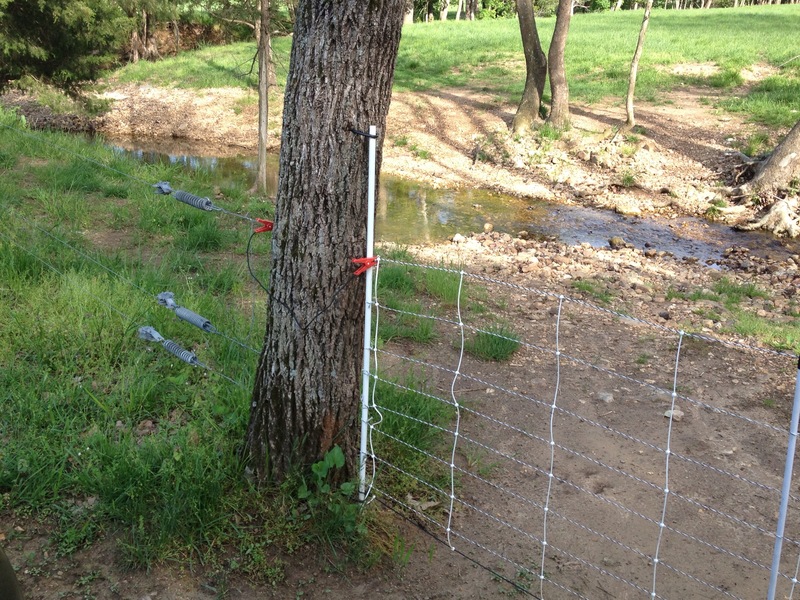 Here’s a list of ways we recommend minimize risks to your horses behind electric fences. 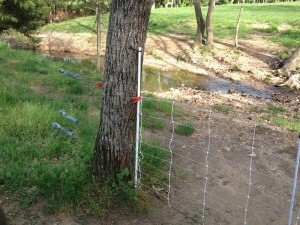 This is probably the most important aspect of building a safe fence for horses. Horses have remarkably thin and sensitive skin, and they also have a knack for finding any spots that have sharp edges to rub on or run into. Though there’s no such thing as completely “horse-proofing”, look at your fence the same way you’d look at your home for toddler proofing – find ANYTHING that might cut their skin or cause injury to an eye. Then remove it, cover it or otherwise find a way to reduce your horse’s exposure to that sharp edge. Horses, again in their knack for “finding a way to hurt themselves” will inevitably end up on the part of the fence that isn’t safe. The inline strainers we used caused some of the damage but it was the stripped wire where I connected the wire to the strainer that caused the most damage. I crimped the wire but left about 4 inches of wire past the crimp which was quite sharp. I would suggest using strainers/fence tighteners that don’t require the coated wire to be stripped in order to attach the strainers or corner insulators. If you do strip the wire one of our customers suggested you cover the sharp ends with wire shrink wrap http://www.lowes.com/Electrical/Electrical-Tools/Heat-Shrink-Tubing/_/N-1z0yt20/pl#! 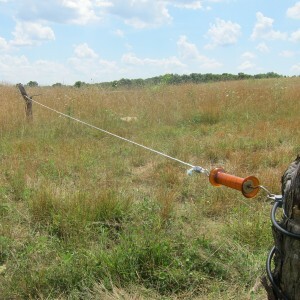 Electrified horse rope uses non-metal tightners on the fence which adds to their safety. 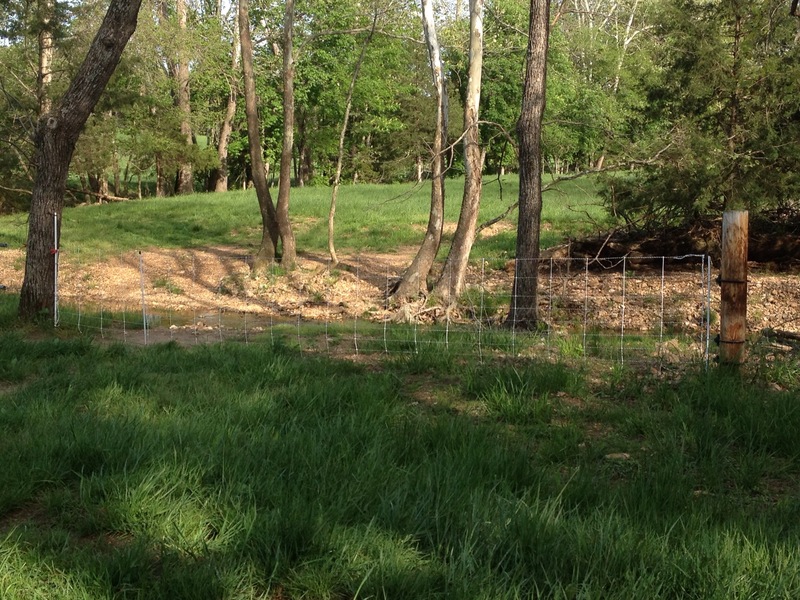 Here’s a link to one of our articles about building a fence with one of these products. 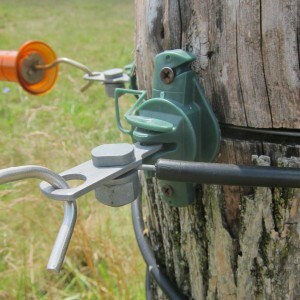 We’ve been asked by several of our customers if our posts would work in a non-electrified environment. We don’t recommend it, primarily because horses like to rub on fences that are not electrified, which will damage your fence and lessen it’s life span as well as requiring a lot more wire to physically control them . The electric shock acts like a “nip” to the horse and encourages them to stay away from it. We recommend teaching your horse about electric fence and once they respect it they leave it alone but don’t have a great fear of it. However, if you do want to put up non-electrified fence PasturePro posts used in conjunction with rigid line boss posts can make a fence safer than any fence made with a t-post. Often, up pops the question of how we keep baby calves within a one wire interior fence. My answer is, “we don’t”. Now, to explain that answer in a little more detail, let me describe how we manage our cow herd. We calve in a 45-60 day period, so all the calves are of similar age. We don’t run separate herds in the same paddock system, so no chance for calves to get into another herd and become mixed. And these are one wire interior fences- our perimeter fences are more substantial. When we are moving the cows slowly through the paddock system during calving, we rarely have problems with calves becoming separated from mama, as they have what I think of as an invisible leash on them. They might wander a bit, but it usually just takes a little speech from mama to have them hustling back. All seems quite natural as we move the calving cows daily to new grass and the newborn calves learn to follow mama as we roll up the poli-wire and they get the new stretch of grass. Where the trouble can begin, is when we move long distances with baby calves. This is where we like having one wire fences so babies can easily walk under the fence if they miss the gate. Even though we make large gate entrances it seems when 200 pair are going through, there are always babies who miss the gate. With a one wire fence it doesn’t really matter, for they can pretty well get through anywhere to catch up with the herd and mama. With a 2 or 3 wire fence, the calves get shocked and sometimes go on through but sometimes get rattled and head off the other way. We don’t see any fence! One day, as the calves grow, we’ll find a few calves on the wrong side of the one wire fence and have to put them back through a gate as they now are afraid of going under the fence. This is usually the last time we have calves on the wrong side of the fence, as they have learned that the fence can bite! It’s always interesting to see the different methods farmers come up with building electric fence gates. The choice for materials and design is large and of course it matters what kind of livestock is being contained in determining number of wires etc. Sheep and goats present large challenges in coming up with a gate that’s simple to pass through but will still keep the girls from getting through. One we used and I’ve seen used by others- takes PVC pipe and several rows of high tensile wire to make a multi wire gate. We disliked these–always wanting to tangle and the PVC would get brittle and break over time. 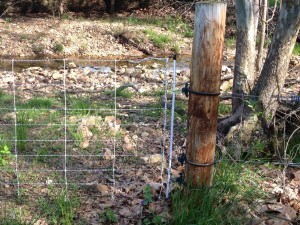 The best sheep gates I’ve seen were made by Bruce Shanks and used coated fiberglass rod on the ends connecting a section of electrified portable sheep net for the gate. It was easy to open and close and definitely worked to keep the sheep in the paddock. Loops top and bottom to insert gate post. Top loop lifts to open gate. Here are some thoughts on design and a list of the construction materials we’ve used over the years in building gates. Using gates to power the fence- In other words when you open the gate the power on one side is lost. We now like the entire fence to be on all of the time and if you use gates as switches it means all your gates need to be hooked up all the time. Not only that, but the conductivity is not nearly as good with a gate handle as when you use a split bolt or crimping sleeve to make connections. We now go underground or overhead to make the connections from one side of a gate to another. If you decide to use a gate to power the fence please make sure you connect it so the gate is not hot when you open it. People with a hot gate in their hand hold it like they have a live snapping turtle hooked to the handle, and with good reason, as both can bite pretty hard. Another reason to make sure the gate is dead when you unhook is to avoid leaving a live gate on the ground as it can kill box turtles coming in contact with the wire. They can’t move fast enough to get away from the shock and it gives them a pretty sad death. 12.5 gauge high tensile wire- We used a lot of this wire for our gates but found ATV riders and cattle often didn’t see it well. 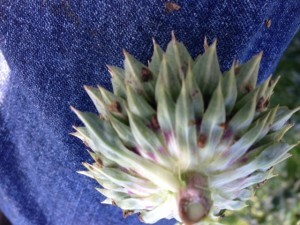 It also sprung back and often tangled when laid on the ground. At a time when all our gates were made with high tensile wire and plastic gate handles we took a two day trip. One of our rules when we go anywhere all day is to close all the gates on the farm including the lanes to ensure there is no way the cows can get out. We left the cows with plenty of pasture but our elderly friend worried about the cows and decided to check them while we were gone. We appreciated his thoughtfulness when we got back and then began repairing all the wire gates he had driven right through without knowing when he drove his truck to the far back side of the farm where the cattle were pastured! Spring gates- We like these, but like the 12.5 gauge wire they are easy to miss when driving through on an ATV. One company paints their spring gates white, which should make them more visible. Bungy gates-Bungy is similar to using 1/4″ rope but it’s elastic and electrified. We really liked it when it first came out but have found over the years that it has a short life span and is relatively expensive. Lots of difference in quality, but difficult to know the quality until you have had it up a year or so. Rope gates- This is the gate material of choice for our one wire gates. 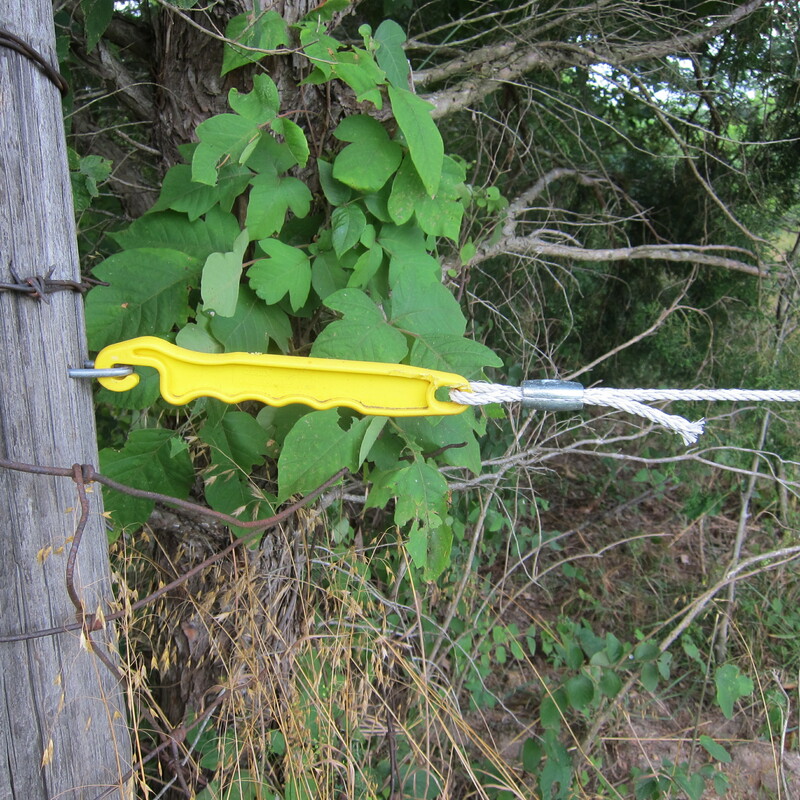 We use electrified 1/4″ rope with a plastic handle and have found these gates to last a long time and are easily seen by someone on an ATV and the cattle. I described how we build these simple gates in a previous blog. Underground wire- We use conduit and double insulated 12.5 wire for all our undergrounds. Since we make our gates 20-40′ wide we want to make sure that if somehow the wire fails we can pull it out and insert a new wire without having to dig it up. We use 1″ HDPE pipe for conduit and seal the ends with silicone so no water gets in the pipe. While it’s rare for the insulated wire to fail, we have had it happen a couple of times-once from a lightning strike- and adding the conduit ensures a rock doesn’t puncture the coating of the wire. Over the years we’ve tried numerous styles and materials in making our electric fence gates. Spring gates, bungy gates, high tensile wire and cord, but it seemed we never could find the right combination. The least successful gates occurred the year we used bungy cord that turned out to be a real lemon. It stretched and sagged so fast that our son-in-law said he was certain he heard the lead cow telling the others as he installed the gates “don’t worry girls, just give it a couple of days- the gate will sag to the ground and we’re out of here”. To remove the sag we kept tying bow knots in the bungy until it began to look like one continuous knot. A lot of our neighbors bought that bungy-and you could always tell from where it came by the knots dangling in the line.. Since we don’t run sheep anymore we have evolved to a one wire gate, usually 25-30’ wide. We started off making our gates 16’ wide because that’s the distance between posts for metal gates–the old “because that’s they way we’ve always done it” syndrome. With an electric fence gate it’s easy to stretch it out to even as much as 40’ which can make it easier moving large groups of cattle or equipment through. For materials we’ve developed a pretty simple system. -we have found the rope will contract over time and especially in cold weather. Don’t make them fiddle tight and leave some tail through the rope clamps so you can lengthen the rope easily if needed. -cattle love to chew rope. Why- I have no idea. So don’t leave it laying about in the lanes or you’ll find a gooey mess with broken filaments on your hands. A smart idea, and one we haven’t used, is to make a wire loop on your fence so when you want to leave a gate open but the cows will still have access you can hook the gate to the fence and make it hot, saving it from the mouths of cows. One of my first jobs was working for a cattleman who enjoyed using Brahma bulls on different breeds of cows. Many of these cattle were raised on leased ground with little to no cross fencing or permanent corrals and they became somewhat feral over time. My hiring had as much to do with the Border Collies I owned at the time as my ability as a farm hand. My dogs and I hired out to round up cattle and Ronnie [my employer] had a lot of rounding up to do! Work on this farm was often exciting and I have fond memories of running through the woods with my three dogs in pursuit of 200 wild brahma cross cows. We could usually pen most of the cows, though I do remember Ronnie selling hunting rights to a few girls that never could be caught. Once we had our own herd, working cattle became much quieter. We used dogs, but in a very controlled manner with a goal to never get the cows out of a walk. We have continued to work on our stockmanship over the years and work cattle as quietly as possible, while selecting and breeding for very quiet cattle as we believe the calmer cattle make for better cattle and certainly more enjoyable cattle-though I must say working cows now lacks the excitement of my early years in the cattle business. I like to find studies that back up what I want to believe anyway, and here is one that does just that for me. An interesting paper about calmness and fertility that had some surprising conclusions. One being that mature cows do not get more docile with gentle, frequent handling-but gentle, frequent handling of heifers does make a difference in temperament and breeding percentage. After years of digging, mowing and occasionally using spray I wrote of our learning to manage for and allowing musk thistle weevils to keep our thistles under control. 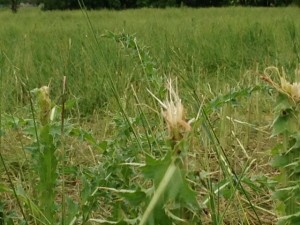 http://www.pasturepro.com/blog/2010/06/controlling-musk-thistles-with-weevils/ Well after last years record setting drought the weevils have quite a challenge. The drought was severe enough to kill all of our ladino clover and I didn’t realize what a large percentage of our pastures ladino had become. Large bare spots appeared last fall from the decimated Ladino clover and it looks like thistle seeds have been laying in wait for just such a moment. We know that the weevils, in combination with a good healthy sod, control musk thistles very well–what I don’t know is how they will do when the sod is not as strong as in the past because of the drought. As I check the pastures I’ve been looking for signs of the eggs laid by our flower head weevil [Rhinocyllus conicus forelich]. The weevil lays her eggs and adds partially chewed plant material which makes the eggs look like warts on the plant. I found them and they are in abundance! We also have the Rosette Weevil [Trichosirocalus horridus panzar] working on the plants. This weevil starts earlier and the larvae feed on the center stem, stunting, or even killing the plant. But what really surprised me was finding our yearling heifer group starting in on immature flowers. While we’ve had a few of our brahma cross cows nibble and bite off flowers I’ve never seen the large bunches of flowers eaten like our young girls are doing this year. And no they aren’t starving, in fact the last weighing showed they were gaining just about 3lbs. a day. Here’s a photo of the chewed off flower heads. While I know what biological control can do, it is tempting to bushhog the patches this year. But I have come to think of the weevils as tiny livestock and I don’t want to take their food source away! It will be interesting to see the results this fall as the grass and sod are returning to their previous vigor and it looks like the weevils may have some help with thistle control. As many of us are doing, I’m slowly making the transition to reading my magazines online. I still best enjoy having a magazine or book in my hand but see the the benefits of receiving my reading material online. I think it’s a great way for a small community like graziers to be served without the large expense of a paper publication. For many years the only publication dedicated to grazing livestock was The Stockman Grass Farmer. SGF was practically my only source of grazing information in the 80’s and 90’s [before internet] and while I still look forward to receiving new issues it is now just one source of grazing information for me and they don’t have an online presence. Graze magazine gave us an additional magazine option in the 90’s and they recently started a new website, www.grazeonline.com where you can view articles from the magazine as well as a complete sample issue you can download. I always look forward to Joel McNairs editorial columns. Other sites I like to visit. On Pasture–a brand new online grazing magazine. One of the founders of the magazine is Kathy Voth who is well known for her ability to teach herbivores to eat weeds. Agricultural Insights–Chris Stelzer has a truly innovative website. Using podcasts and videos, Chris is really giving us access, through interviews, to some of the most notable names in the industry. Would like to hear others favorite sites. Driving 3″-4″ pipe for corner posts is quite popular in our area. It used to be our choice before we began using Hedge for our corner posts. 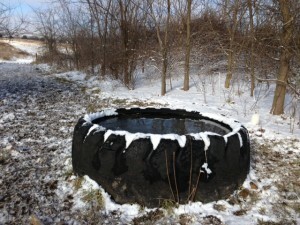 Pipe can be driven even in rocky ground and will last at least 20 years. For some reason when we were using pipe for corner posts we also switched from using bullnose corner insulators and began using wrap-around insulators. Turned out to be a mistake as we’ve found the wrap-around insulators on a pipe corner will often split and crack allowing for quite a short. They work fine on a larger wood posts but the smaller arc of the pipe corners seems to cause them to fail and when we do replace the wrap-arounds with a bullnose insulators we find the high tensile wire inside the wrap-around is often corroded. 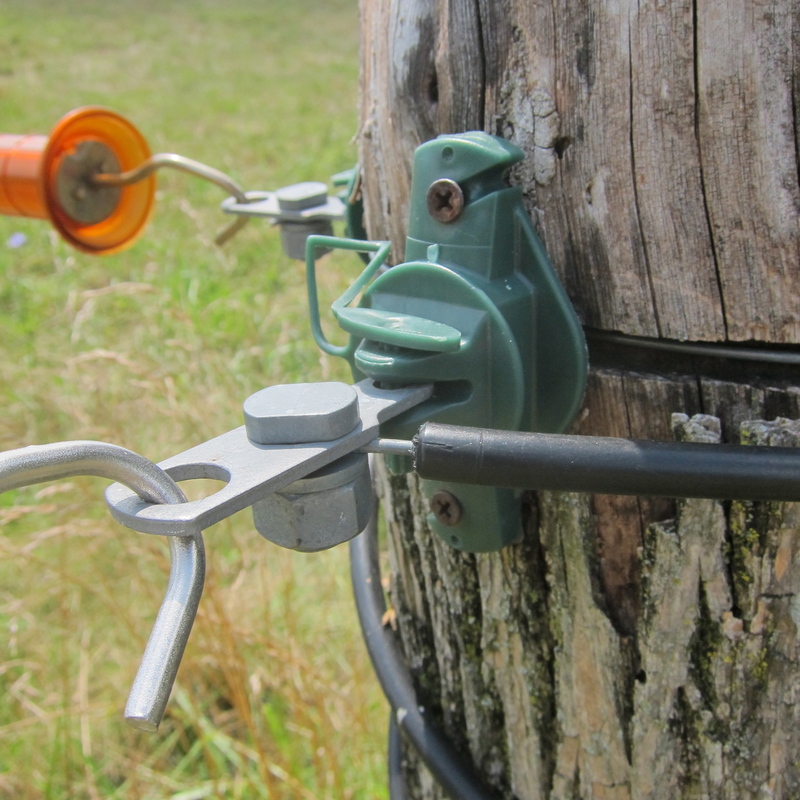 You’ll see in the photo how I temporarily fixed a split wrap around–stuck a no kick [insulated handle] between the post and insulator to keep it from arcing to the corner. If you look closely you will see the cracks in the insulator. This is an old fence which we plan to replace soon so I used this very ugly but quick method to fix the short. We have quit using wrap arounds. I’m not really sure why we began using them in the first place as a bullnose corner insulator is easy enough to attach and will last 20 years.